Researchers at Oak Ridge National Laboratory (ORNL) and Aramco Services Company have jointly conducted a study on residential parking availability and its effect on plug-in electric vehicle (PEV) ownership in China. China has been the world’s largest highway vehicle market for nearly a decade. The total vehicle stock reached over 151 million in 2015, and studies anticipate that China’s vehicle stock will reach 400 to 700 million by 2050. It has also become the world’s largest market for plug-in electric vehicles (PEVs). In 2015, approximately 191,000 PEVs were sold in China, more than the total sold in all Western Europe (184,500) or in the United States (115,262). The country’s rapid urbanization and motorization have led to the typical challenges that accompany explosive growth: air pollution, urban congestion, energy security, and other issues. Plug-in electric vehicles could be part of the solution for mitigating air pollution and improving energy security. 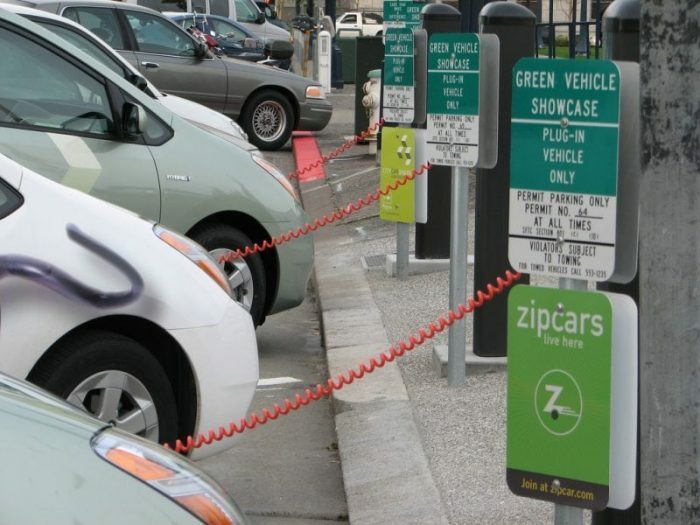 However, a shortfall in residential parking space for charging infrastructure may make PEVs less attractive to buyers, especially in congested cities. Home charging is widely considered the most important charging option for PEV adoption, and that requires adequate dedicated residential parking spaces. However, unlike most new car buyers in the United States, Chinese car owners predominantly live in high-rise apartments where parking spaces are usually limited. Even in megacities with both private and public parking spaces included, the ratio of parking spaces to vehicles is only about 0.8. “Understanding projected residential parking space availability as a potential constraint is important to predicting the future PEV demand in China or to addressing such an infrastructure barrier to vehicle electrification,” according to Dr. Zhenhong Lin, co-author of the study and team lead of the Transportation Energy Evolution Modeling (TEEM) program at ORNL. 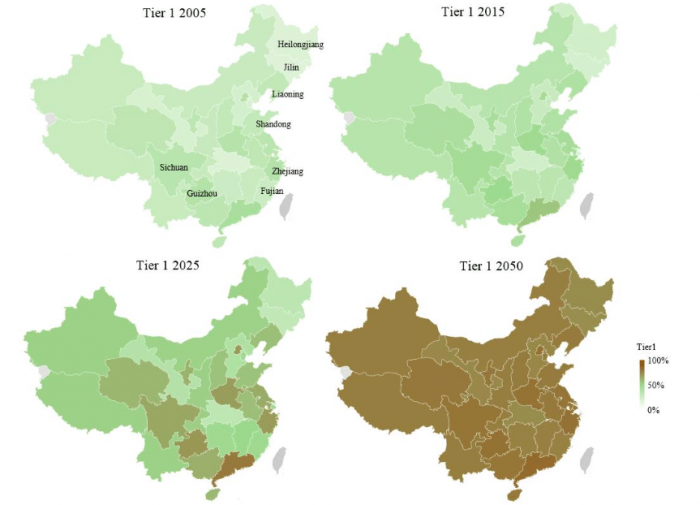 The study projected the residential parking availability by province/region and by urban area type in China from 2005 to 2050. It divided China’s urban areas into three tiers into 31 provincial regions in mainland China based on their administrative partitions by the Chinese government. Residential communities were then segmented into four groups based on construction year—2005, 2015, 2025, or 2050. Aramco Services Company, the sponsor of the study, has been funding ORNL to study motorization and electrification trends in China and the implications for transportation energy demands. The study collected residential community information covering over 100 cities across the 31 provinces from the largest internet real estate transaction websites in China. This data was used to estimate the impact of residential parking on PEV ownership. The study’s goal is to inform researchers, industry, and policymakers in evaluating PEV market prospects in China. Study details are described in Estimation of Vehicle Residential Parking Availability in China and Quantification of Its Potential Impacts on Plug-in Electric Vehicle Ownership Costs. The weighted parking availability is projected to improve significantly across the nation between 2005 and 2050 (Figure 1). However, there are noticeable differences among regions/provinces. For example, some provinces that experienced urbanization prior to the motorization boom in the early 2000s, such as Heilongjiang and Jilin, have lower parking availability. This is because much of the infrastructure was designed and built without planning for high vehicle ownership rates. In addition, urbanization rates moved slowly in these provinces when their economic growth fell behind that of other provinces. On the other hand, most developed regions, specifically the coastal areas, have better parking availability than less developed regions. For example, Fujian, Shandong, and Zhejiang have a higher parking availability than the national average, and parking availability among the three area types is well-balanced. It should be noted that economic level is not the only determinant of parking availability, so parking availability is not always higher in prosperous metropolitan areas. For example, parking availability is much lower in Shanghai than it is in Beijing and Tianjin, China’s other two major cities, and it is the lowest among all of China’s metropolitan cities. This could be due to Shanghai’s high vehicle density, high land prices and early urbanization. Second-mover advantage may play a critical role in helping less developed regions. For example, Guizhou and Sichuan provinces are projected to have more parking availability than most provinces. This could be due to second-mover provinces learning from the urban planning experiences of other regions, recent economic growth generating new urban residents and communities, and cheaper land prices making it less costly to build residential parking. Parking availability also differs among area types, with Tier 2 areas (suburban areas in direct-controlled municipalities and prefectural-level cities) lagging behind Tier 1 areas (urban areas in direct-controlled municipalities, provincial capitals, and sub-provincial municipalities) and Tier 3 areas (urban areas in the county or township levels). In 2015, weighted parking availability is estimated to be 46.2% and 43.6% in Tier 1 and in Tier 3, respectively. However, it is only 38.6% in Tier 2. This disparity is expected to decrease over time. Figure 1. Estimated residential community-weighted average parking availability in mainland China. Republished with permission from ScienceDirect. The study estimates the mean shadow value of a residential parking space to range from $2,376 to $10,687 USD, depending on PEV model, with the upper value close to the subsidized price of some PEVs (Figure 2). For all-electric vehicles, the value is generally greater for those models with a shorter driving range. The shadow value also tends to be greater for all-electric vehicles than for plug-in hybrids, which can operate on gasoline or electricity. Relative to the level in 2015, the total incremental value of residential parking is estimated to be over $2.51 billion USD in 2025. This represents a significant co-benefit of the projected residential parking improvement for the PEV market. Overall, it concludes that residential parking availability is an important factor affecting PEV market penetrations. Figure 2. Shadow values of residential parking by vehicle type for owners who have no residential parking places in 2015. Republished with permission from ScienceDirect. The findings of the study may contribute to a better understanding of both current and future residential parking availability in China, allocation of resources for public charging or home parking/charging, future PEV incentives and policies, and the potential effect on PEV ownership of land use policies that could significantly alter projected home parking improvements. These findings are described in the article entitled, Estimation of Vehicle Residential Parking Availability in China and Quantification of Its Potential Impacts on Plug-in Electric Vehicle Ownership Costs, recently published in the journal Transport Policy. This work was conducted by Shiqi Ou and Zhenhong Lin from the Oak Ridge National Laboratory, and Xin He and Steven Przesmitzki from Aramco Services Company.